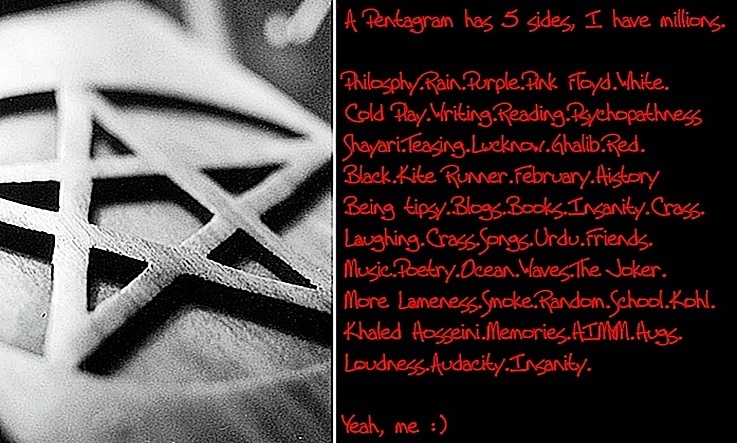 Pentagram: Better half and insignificant others. Isn't it incredibly funny how we build our lives in our heads? Where we think we will settle down, the city we will open our intricately carved ornate windows to - the windows belonging to a house which is rustic and yet very aesthetically sublime, a house that will be blanketed in warmth of two people who will be as madly in love with each other as they were two years back when they met each other. I fancied you'd return the way you said, But I grow old and I forget your name. I like emptiness. The most. Yes, its my favorite emotion, if you are kind enough to believe it qualifies as an emotion at all. Its not bright hued, incarnadine and crimson like joy, sorrow, love or cobalt and jaded and faded like sorrow, misery, faithlessness. It has all the tints and pigments I ever saw the world in and none at all. Today, it shimmers through the edges of your smile, another day it dies a slow death around your tears. Its all encompassing and yet contains one thing, yes, nothing. Emptiness, I like it the most.You can fill it with every other human emotion possible, and it won't complain. It will step back to make space for more. Something that most of us are so scared to do. We are too scared to make space for the new. You know what else do I like? You. That empty smile you give me, perhaps mocking the end of things between us. You don't ignore me, would that be too unkind? I wonder. You smile at me, and your eyes don't glimmer, they don't give me the will of letting them wander on my face and then return to find them, still at me, a little breathlessly. Those hazel eyes don't urge me to pass nights only staring at them. Not anymore. Your eyes have that look too, empty, barren, black and strangely vacuous. And there's another thing I wish I didn't like, yes, I've been struggling to kill this feeling, and have yielded no success. Your name. Those two syllables, I want to persuade myself to not react to them, not die a little inside when someone mentions them, not think of the perfect times of yesterday, not marvel at the camaraderie, and not die a little death thinking I'm never going to feel it anymore. And, I cannot tell you how truly thrilled I am to read your post. 6 long years and here you are, sprinkling magic with your words. This was poignantly beautiful. How have you been? Yes,you've got the permission to add on to the insanity.. This is a Flickr badge showing public photos and videos from .Crystal.. Make your own badge here.